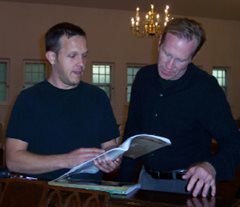 Vocal ensembles of two or more members who are interested in working on individual and group vocal technique may reserve a regular or an occasional two-hour coaching session to learn new material, improve the group's overall sound, and prepare for performance. A combination of vocalizing and working on specific repertoire is used to improve individual and group sound. Various techniques are used to encourage the group's awareness and intuitiveness of each other. Stage presence and group expression is emphasized with groups preparing for public performance. The cost is $30 per person in the ensemble for each hour-long coaching session. Click on the link below if you have a question or wish to schedule a session.